If you have been a long-time Vent Day watcher then you will know exactly why I titled this post like I did. For those who have no clue these would be my junk drawers that Dwayne gets annoyed with. I say they are chock full of great little things that you might need some day. It beats having a big office downstairs filled with boxes of....well I don't know exactly. 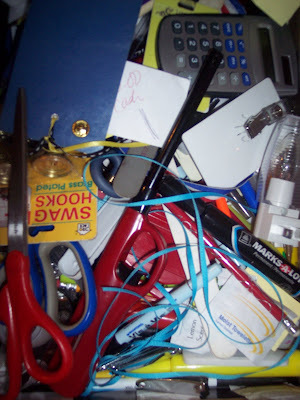 Tell me, don't we all have at least one drawer in our home that resembles this? 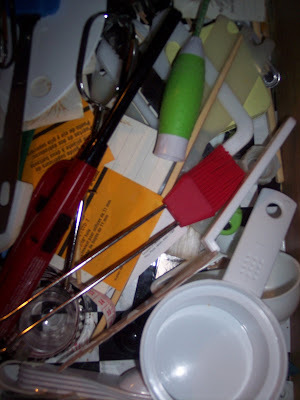 I have a huge junk drawer that I keep telling myself I am going to clean one day. Only thing is every time I open it I am putting something else in it. We had one at my mom's when I still lived with her... it's still there. And it still drives me crazy. My junk drawer has compartments, and everything, well mostly everything has its place. It gets cleaned about once every few months. I know, what a freak I am... but nothing else is organized you'd cringe at my kitchen utensil drawer (the one that has the big spoons, spatula's, turkey baster, nifty herb cutting thingy's, ice cream scooper, you get the point) It's a complete waste of a big drawer... but I have no where else to put them, so they get thrown in, literally thrown. I have plenty of drawer space, and one drawer for miscellaneous items to include pens, pads, old keys, and the like in a divided drawer trays. I’m all for organizing – everything must have a specific place. I have a few that look like that. Hmm, one day I will get organized. Yes girl we have one...no matter how many times we move and I say Im gonna have a better organized drawer we always wind up with one...and it always seems to be in the kitchen lol! I'm not feeling so bad anymore. We have more junk drawers that we should. But at least we know where to go rummage through when we need certain things right? Junk drawers are the best. I have a junk drawer in the kitchen and another one full of any type of battery you may need. Me and the kid stay arguing over him trying to put new batteries in his stuff all the time.